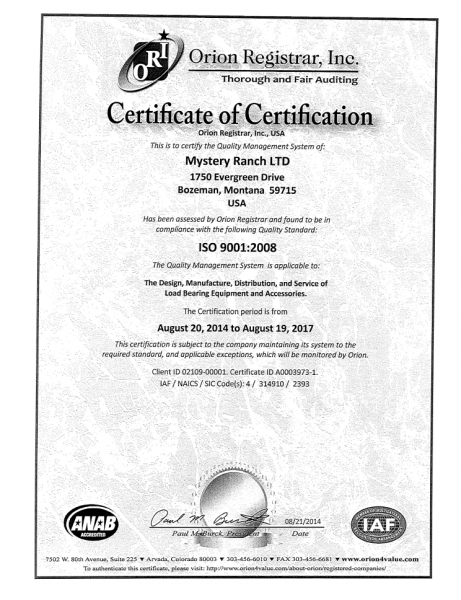 Mystery Ranch ISO 9001:2008 Certification is Official! If you had been visiting Mystery Ranch on a Friday at the end of June, you would have been surprised by all the hooting and hollering. If you worked at the Ranch, you would know that really, we do this all the time. But this celebration was something different. Dana Gleason, with great fanfare, and in front of a floor of momentarily motionless sewing machines, had just announced that our ISO 9001:2008 registration audit was over – and our auditor was recommending us for certification! Now, for the acronymically overwhelmed, that last sentence may mean very little at first glance. But for us, it means the culmination of over two years of preparation and effort put into our quality management system. 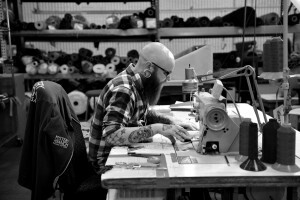 At the Ranch, we’re committed to upholding the highest standards in the industry for design, craftsmanship, improvements, and customer satisfaction. 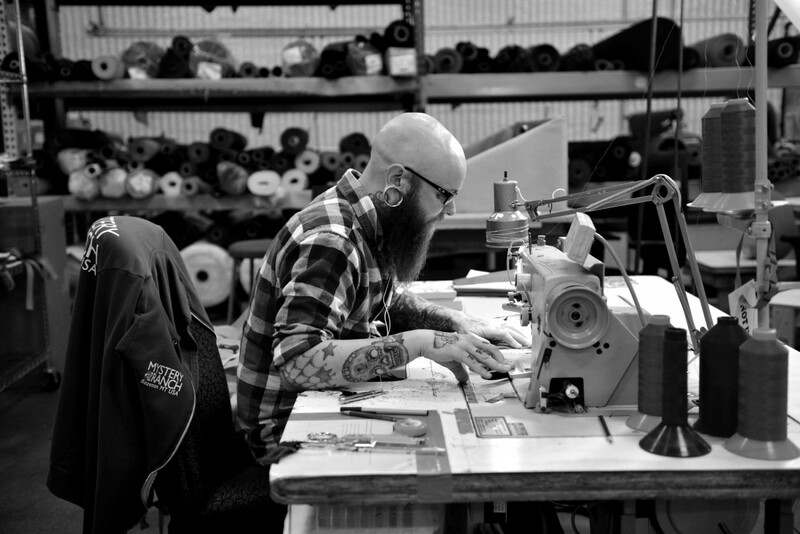 Not all gear is created equal, and we wanted to ensure that the quality management system that backs those high standards was also one of the best in the industry. After thorough research, several intense analyses of our existing system, and a few not-so-gentle nudges from potential customers in Europe and the fire industry, we chose to start work towards ISO 9001:2008 certification in October of 2012. We officially received our certificate on August 20, 2014. 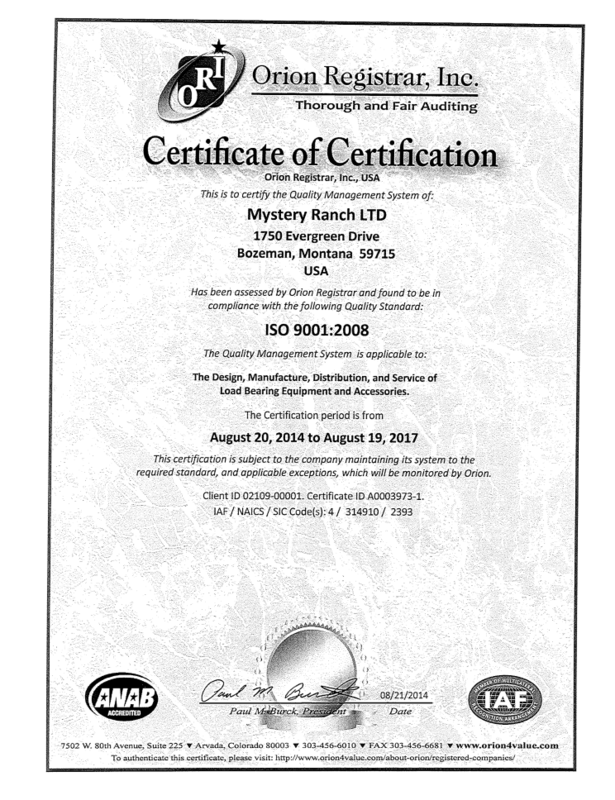 This certification is characteristic of a select group of top-level companies, and our commitment to it starts with our top management, and is fully embraced by all Mystery Ranch employees. Some companies keep their quality system somewhat separate from day-to-day operations, hiding the complexities and documentation from hourly employees. When they’re audited, they steer their auditor to the people who have been rigorously “prepped” for any possible questions. 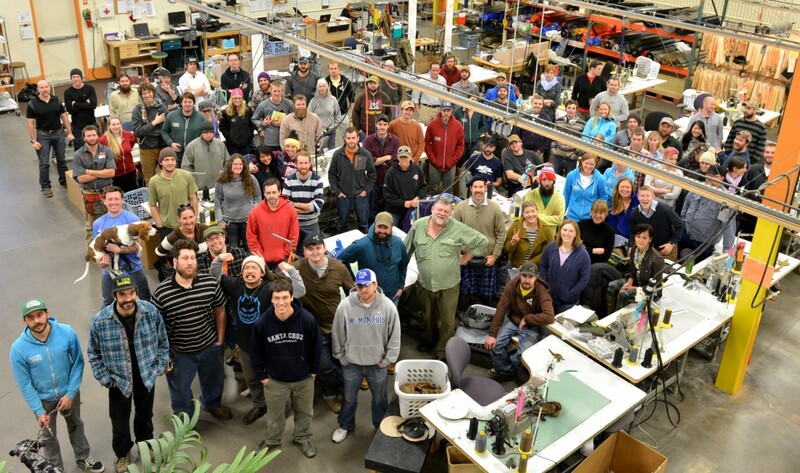 Here’s to many more years of great packs and happy customers!